Made in Serbia, this 8mm Soft Point by Prvi Partizan is a quality hunting round. 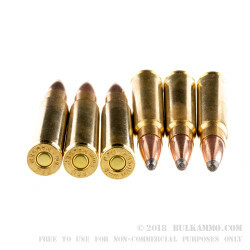 This is the .323" diameter bullet with a rimless brass case. The rimless version of this caliber of ammunition was the first of its kind, developed by the Germans in the late 1800s. 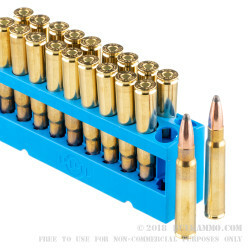 It was the first rimless cartridge utilizing both smokeless powder and full metal jacket projectiles, and it became the first small-arms cartridge used in the machine gun platform. Now it is still produced by a few manufacturers in the world, mostly in Europe. The Spanish forces used this cartridge in the fight against Teddy Roosevelt in the Spanish-American War. Being exposed to the advanced weaponry led the US Army to work on developing a similar cartridge to replace the rimmed .30-40 Krag which was the primary service round at the time. 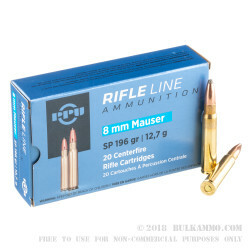 They developed the .30-03 cartridge as a similar design to 8mm Mauser and then three years later revised that cartridge and the .30-06 was born. Prvi Partizan manufactures an impressive variety of ammunition for both practice and hunting uses. 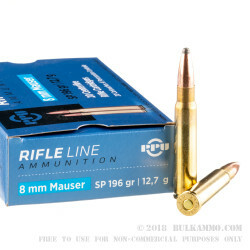 Plan to use the 8mm soft-point from PPU on your next hunt.